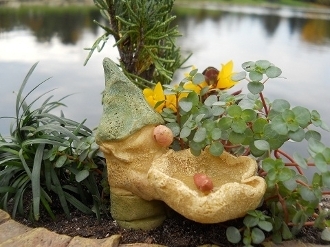 Gnome holding a birdbath. Dimensions: 2¾”. Tall Item#: GBB9987. Product Info: Resin. He's probably carrying it around for a fellow Fairy rearringing your Fairy Garden Store garden.